As humans, we were not “designed” to stay for long hours in a sedentary position indoor. For thousands of years, we spent hours every day in a natural environment. This is why if your mind lacks the green scenery, even the most comfortable desk and chair won’t boost your productivity. Luckily, there’s one simple trick you can do to skyrocket your productivity and enhance your mood – getting an indoor tree. 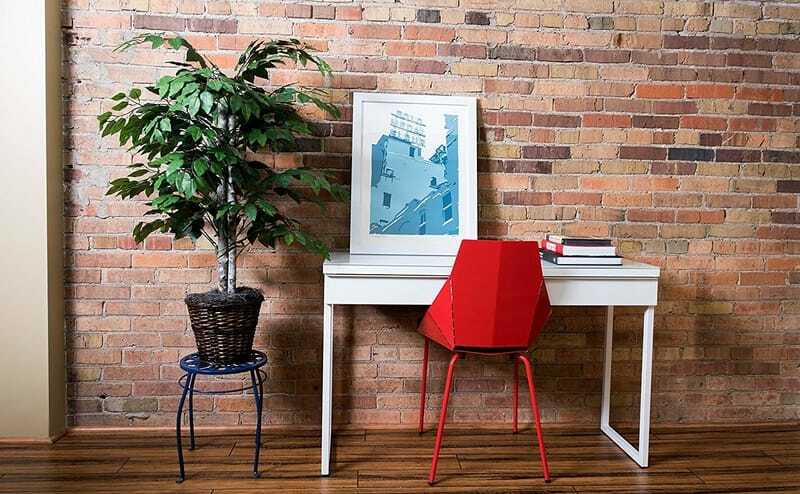 How can it help you and what are the best indoor trees for work? Where to Buy Best Indoor Trees? Numerous studies show that plants kept indoor make you feel better. Green helps us relax and lowers our blood pressure while increasing attentiveness and improving reaction times. This, in turn, helps raise productivity. But these are not the only benefits. The most significant change includes overall improvement in well-being. Having plants in an office is proven to raise job satisfaction, what should not be surprising if you think that our bodies enjoy the presence of green plants simply because it’s natural to them. Interestingly, some studies, such as a research on hospital patients show that it doesn’t matter whether the trees are real or artificial – what counts is whether they look natural. This means that the only thing left is getting one. There are many different places that sell both real and artificial indoor trees. You could go to a local market or a nearby garden center. You could go house plants with variegated leaves or house plants with heart shaped leaves. Or perhaps you like plants with thick leaves or a tree with lights indoor? The problem is that they usually have a very limited choice – simply because indoor trees are quite big and those stores usually offer many other products. Plus, transporting a big indoor tree is not the most convenient thing to do. Luckily, with today’s development of e-commerce, it’s easy to shop for indoor trees online. You cannot only choose from thousands of different types but will also get them delivered right to your door. To save you from having to browse hundreds of offers, I picked top 8 indoor trees that will boost your productivity right from the get go. First, let’s see how I selected them. Typically, there are two main groups of indoor trees that you can choose from: artificial and natural. Natural green color. If you decide to go with an artificial indoor tree, make sure that its color looks natural. That way you can have all the productivity benefits of a real tree without the hassle of watering or trimming. Naturally, if you go for a real tree, you can ignore this point. Easy to take care of on a daily basis. You don’t want to buy a tree that you have to treat like a baby. Its role is to help you relax and make you more productive and not take an hour of your life every day. Some trees require watering two times a day while others can go for days or even weeks without it. This is also crucial if you travel a lot, be it for business or leisure. Don’t mind indirect sunlight. Not all indoor spaces receive enough light for all plants. If you want to put your indoor plant in a study and it doesn’t get a lot of sunlight, you either need to pick an artificial plant or one that doesn’t mind this. Fit the purpose. This takes us to the last point. 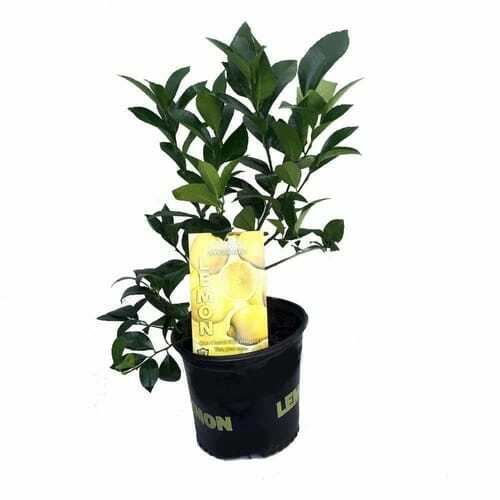 A lemon tree will reward you with juicy fruits but it’s not the best pick unless you get a lot of sun. 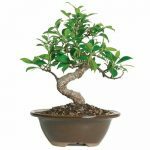 At the same time some small plants such as a bonsai tree can grow under a lamp and look terrific on just about any desk you can think of. Ceiling Height - If you have a low ceiling you may want to go with a smaller tree (too obvious right?). However, many people try to fit in large trees with small ceilings. Why? Because they forget to measure the height of the ceiling and the height of the tree. With smaller indoor trees, your room will look bigger as well. That's because the indoor tree is often compared to the height of the desk. Smaller tree, bigger desk. Bigger tree, smaller desk. When I compiled this list, I looked at both artificial hassle-free plants and at small natural plants that are ideal for indoor and can be taken care of with minimal effort. 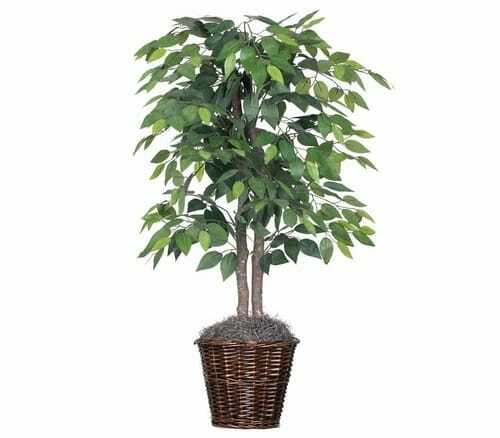 6" x 5" x 2 1/2"
This big, 6’ tall silk Ficus tree is one of the best indoor trees for office spaces that get little to no sunshine. Its trunk is covered with over a thousand of life-like individual leaves what helps create a very relaxing atmosphere. The tree comes in a very solid packaging and is in a small yet very stable pot filled with concrete. The only drawback is that its decorative moss can get messed up during transportation – but it’s very easy to put it all back together or hide the bigger, preferably ceramic one. The best part? The ficus tree with lights. Hang some on for any festive occasion and it's sure to stand out. Despite so many leaves decorating the treetop, thanks to its slim trunk this tall plant doesn’t feel overwhelming and takes very little space. Triangular leaves. It's a special plant with triangular leaves that stand out from the rest of the plants and indoor trees. It’s top-heavy and falls easily so you need to put it in a heavy pot, close to a wall or in the corner of the room. If you like tall plants but want one that still feels minimalist – this Ficus Silk Tree is the way to go! 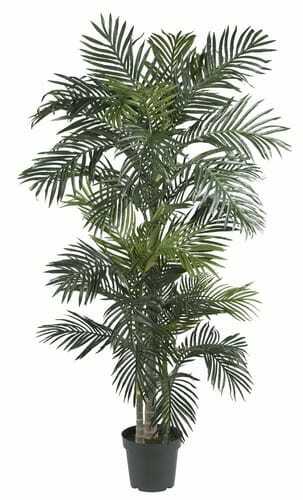 If you prefer indoor palm plants to ficus, you will love this nearly natural palm that requires no watering, trimming or sunshine. It's a tree with fern like leaves. And it stays green year-round, bringing a tropical vibe to any office or study. And by twisting and pulling the branches, you can make it look exactly the way you want. At 333 long leaves and almost 6.5’ height, it can be a bit overwhelming in a small room. That’s why it’s a better fit for a big office space or a living room, where it can remind you of sunshine and help you relax so that you can get back to work more focused and productive. It’s the greenest, biggest and most “optimistic” tree on this list. And yet it requires no regular maintenance! You have to put in some work and adjust the branches to make the tree look more real. 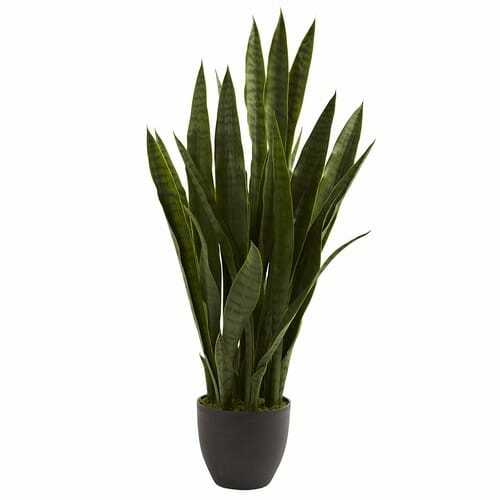 Pot Height (inches): 6.25" H x 6.75"
The Sansevieria is a family of plants with thick leaves. It's an artificial but classy Sansavieria which, thanks to its 28 leaves looks just like its natural counterpart. In fact, because of its deep green color, some of its owners say it looks so realistic that even nature lovers completely adore it. On top of that, you can pull and spread the leaves to adjust the plant to your liking. The plant comes with a black decorative pot, making it look very elegant in any professional office space. It’ll add class to any house or office space, period. It's a plant with huge leaves. It won't escape your eye (which is a good thing) so you can be more productive working at your desk. Different shades. It's a plant with striped leaves so it looks more natural and realistic in your office, home or bedroom. Just like with other artificial plants listed, you have to play with the leaves a bit to make it look more real. It's a plant with spiky leaves. Becareful of running into it especially if you're a taller person. It could hurt! Ready to make your office look even more stylish? Head over to Amazon to read more about this plant. Looking for plants with big leaves? This is your indoor plant with big green leaves. 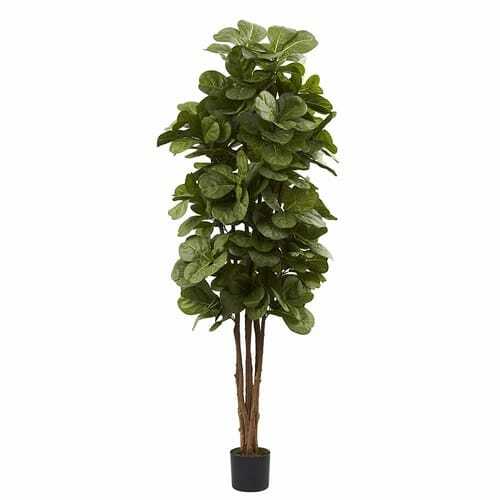 The fourth in the list is a tall (6’), beautiful fig tree with life-like leaves. Its smooth trunk prevents the tree from taking too much space while its green leaves help you relax. All that with no maintenance or watering, ever. Best of all, this plant is very festive. Come Christmas time, it can be an indoor tree with lights. Come Valentines Day, it's your house plant with heart shaped leaves. Unfortunately, the leaves are a tiny bit smaller than those of an actual fiddle leaf tree. But if that’s not a problem and you want a high-quality maintenance-free fig tree, this fiddle leaf fig is a perfect choice. The plant is really FULL of leaves. You need to be very gentle when fluffing the tree. The leaves are very delicate and accidentally removing them from a branch could damage it. The fifth plant in the list is a mix of the natural and artificial worlds. 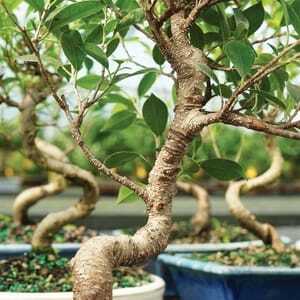 The Vickerman ficus bush connects artificial leaves (over 950 of them, all varying in shades) with thick trunks made of real wood. This combination, put inside an elegant rattan basket, resulted in a very realistic plant that’s an absolute must for all office teams that want a medium-sized (4’ tall) plant that doesn’t need any sun or water. Thanks to the high-quality of manufacturing, the leaves are free from the plastic “sheen” that is common in some cheap alternatives. Some buyers reported broken baskets and damaged packaging due to mishandling during delivery – because it’s a very delicate plant, make sure to inspect the package right when you receive it. If you prefer tall plants and a modest yet classic indoor plant is what you’re looking for, click the button below to see why other buyers love it. When we think about the best indoor trees we typically think about a ficus or indoor palm plants. But what if you could get an indoor tree that not only helps you focus but also gives you the sweetest of all lemons? Meet Meyer Lemon Tree. If you have to name a fruit that grows on a tree, it's the lemon of course. 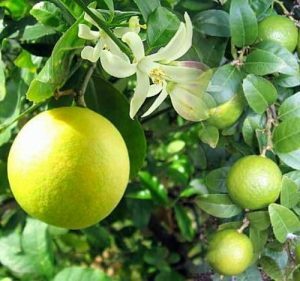 While not the easiest to take care of – it needs a lot of sunlight – nothing can beat the incredible blossoming smell and the taste of home-grown lemons. It can be grown both indoor and outdoor and is resistant to temperatures as low as 40°F. The fruits. There’s no better reward for your care than the juicy lemons this tree grows! While it is advertised that it can withstand low temperatures, it’s best to keep it in a south facing window in a warm patio or room to ensure the tastiest fruits (which can grow the size of a racquetball). Pot Width (inches): 6" x 5" x 2 1/2"
What are the best indoor bonsai trees? And what about those who have very little space in their office but still want at least a little bit of nature to boost their brain juice flow (or simply prefer small plants)? 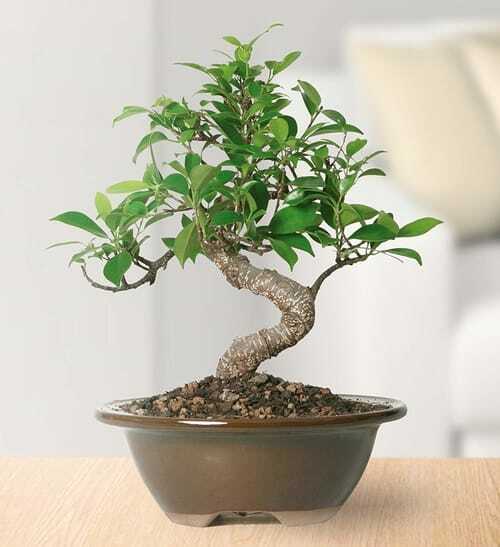 This-four-years old bonsai is a great and fully natural addition to any modern office. While it’s not as tall or spreading as other plants I listed, it can be just as classy and charming. What’s best is that it can be grown even in indirect sunlight. But, if your office gets very little natural light, consider getting a plant light bulb for your desk lamp and setting a humidity tray. The latter can consist of a simple tray with water and some decorations. The water will slowly evaporate, increasing humidity around the tree what will create the most beneficial environment for its growth. One of the best small plants for home study – fits any desk or shelf. Looks beautiful on a minimalist or modern desk. It’s prone to getting infested with common plant pests such as aphids. Even if you keep them indoor, need to check for any signs of those unwanted guests regularly. If you don’t mind putting even more work into taking care of a bonsai, instead of getting an already growing tree, you can get just the seeds. 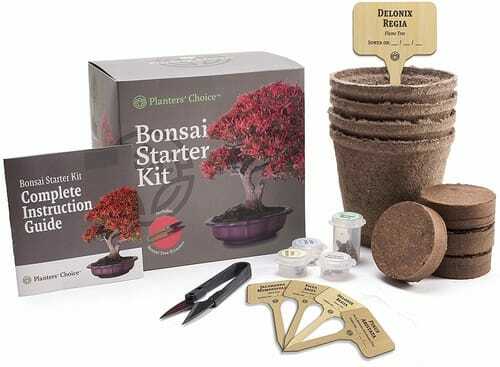 Naturally, you don’t have to be an avid gardener – with Planters’ Choice Bonsai Starter Kit you get everything that’s necessary to kick things off. Better yet, fancy a house plant with red leaves? The set comes with seeds, biodegradable pots, special soil discs, bamboo markers to help you label each pot and a bonsai trimmer for when your trees finally grow. But, keep in mind that while nothing can beat the feeling of watching your very own bonsai grow from just a seed, it might take months to see any results. You get to watch it grow from a seed all the way to a beautiful tiny tree. You will need a lot of patience – it takes a long time to see first results. On top of that, there’s no guarantee that the tree will grow from any of the seeds (although typically most of them sprout). 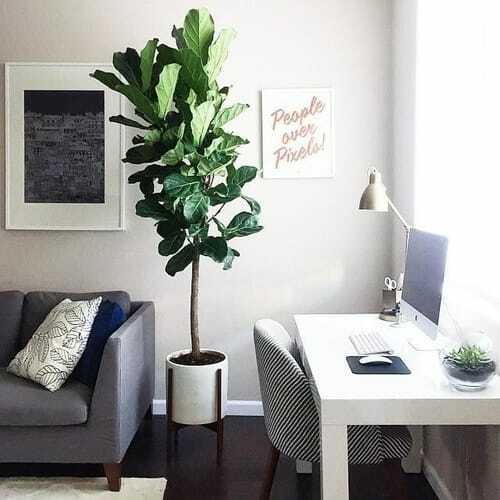 The type of an indoor tree that you choose for your study or office will depend on its size, the amount of sunlight that it needs, and where you want to put it. 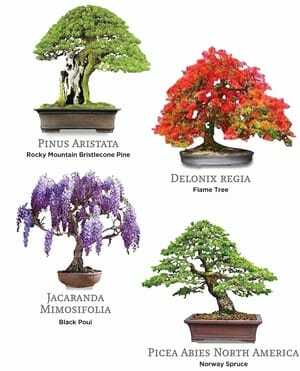 Thanks to the Internet, it’s very easy to browse all the available indoor tree types and choose the best one for you – be it small or tall, artificial or natural. And while ordering a living plant online might sound crazy, all respectable sellers send them in special double boxed and bubble wrapped packaging, usually with enough water and nutrients to easily survive the trip to your home. Still hesitating? Scroll up to go over my list of the best indoor trees once again.